Welcome to the 7th Colchester and North East Essex Ale Trail. 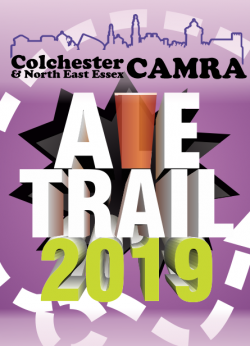 Visit a particpating pub, buy a pint of real ale or real cider, collect stamps and bring along your completed collectors card to the 34th Colchester Summer Real Ale and Cider Festival to swap it for a £10 beer card and your exclusive "I Conquered the Ale Trail 2019" pin badge. The trail is open from 1st April to 1st June. Pick up a card in any of the particpating pubs to get started.